Top Five Mardi Gras Outside of New Orleans! I’ve been fortunate to celebrate Mardi Gras in France, Cajun Country, Baton Rouge and Mobile. Mardi Gras in New Orleans is number 1 in my book. I’m a huge fan of Mardi Gras anywhere! I really don’t care, as long as the effort remains sincere. I prefer Mardi Gras in New Orleans, of course. Even when I lived away I returned for most Carnival seasons. The biggest difference between New Orleans and all the other Mardi Gras? New Orleans retains a fair share of risque behavior, especially in the French Quarter and Marigny. The parade I roll with Krewe du Vieux, is the most ribald parade in existence. Rio Mardi Gras in full swing! 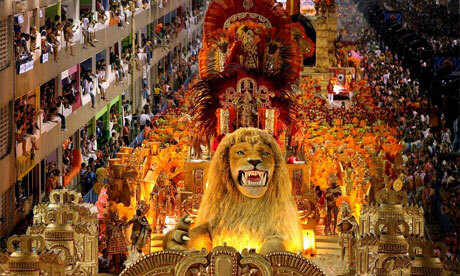 Is Rio the Carnival Capital of the World? Rio’s spectacle draws a half million visitors annually, and the entire Carnival crowd is estimated to be over 2 million people for the final five days of the Carnival season. The highlight of Rio’s Carnival is the Samba parade, which takes place each year at the Sambodromo, a special stadium built specifically to house the annual parade. Samba schools—social clubs consisting of 3,000 to 5,000 members, which represent a particular neighborhood in Rio—spend all year preparing for the parade, and compete with other schools based on their dancing, costumes and music. 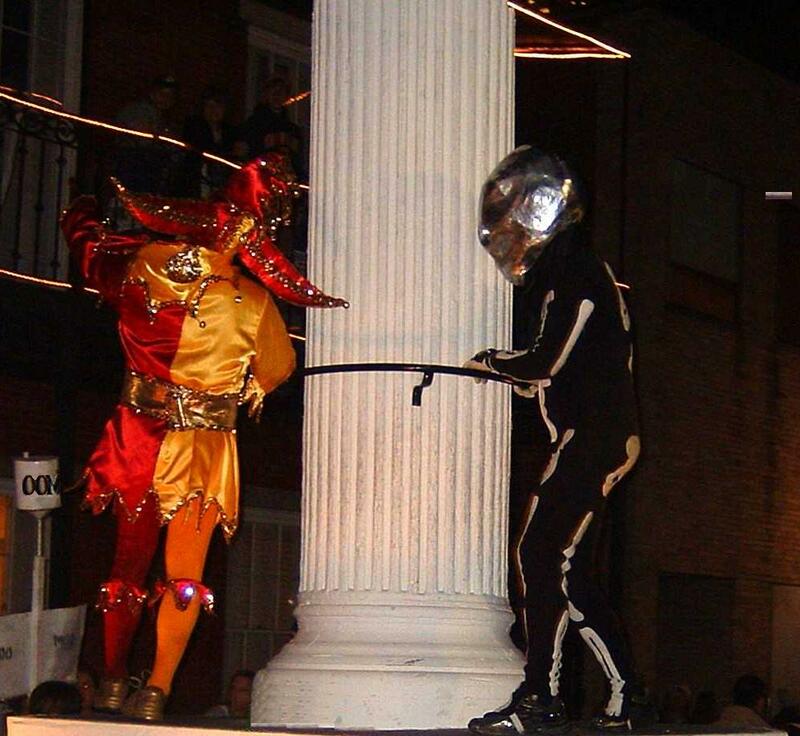 The competition takes place over several nights, with five or six schools parading each night. Brazil Carnivale is fabulous, just fabulous. There is only one Mardi Gras in America older than the New Orleans Mardi Gras, and that is Mobile’s, only 144 miles away. Begun by Nicholas Langlois of France in 1703, fifteen years before New Orleans was founded, although today the Crescent City’s celebration is much more widely known. In Mobile, the first capital of French Louisiana (1702), the festival began as a French Catholic tradition, as do Mardi Gras around the world. Mardi Gras in Mobile has now evolved into a mainstream multi-week celebration across the spectrum of cultures in Mobile, becoming school holidays for the final Monday and Tuesday (some include Wednesday),regardless of religious affiliation. Much the same has happened in New Orleans. In downtown Mobile, there are 38 parades over 3 weeks. Baldwin County has a dozen major parades, and outside of downtown there are several parades as well. The only place I’d move to if I had to leave New Orleans is Lafayette. I’ve spent many a good time in Lafayette, eating the amazing food, going to the fantastic festivals, hearing the Cajun and Zydeco hybrid bands, and meeting the wonderful people. New Orleans is Creole Louisiana and Lafayette is Cajun Louisiana. They have their own unique Cajun Mardi Gras with one of a kind Cajun traditions. Courir de Mardi Gras means Mardi Gras Run. The event is held in many Cajun communities on Fat Tuesday. Barry Ancelet, Cajun historian and head of the University of Louisiana at Lafayette Folklore Department, has explained the origin of the Courir as being in rural medieval France: It’s an early springtime renewal and essentially a way for communities to celebrate and find themselves. Southwest Louisiana shares in this tradition, collecting ingredients for a communal gumbo is the theme behind the run.The Imperial Calcasieu Museum, the largest Mardi Gras museum in the United States, tells the global history of the celebration, along with the best recipes for King Cake and showcases 1,000 costumes. As you wander through the displays, feel free to dance a little fais do-do. Don’t worry about having rhythm. Painted footsteps on the floor will tell you where your feet are supposed to be. Carnevale is one of Italy’s biggest winter festivals, celebrated in the weeks before Lent. The final day of Carnevale is Martedì Grasso (Mardi Gras – Fat Tuesday), the day before Ash Wednesday and the beginning of Lent. Mardi Gras, along with the Thursday before, called Giovedí Grasso (Fat Thursday), are the main days of Carnival. Italy is the birthplace of Carnival celebrations, having its origins in the ancient Roman cult of Saturnalia, fertility rites to honor the god Saturn. You can still see the ruins of the Temple of Saturn at the Roman Forum in Rome, where they used to hold sacrifices. The most famous and typical Carnivals in Italy are in Venice, Viareggio (on the Tuscany coast) and Ivrea (Piedmont). However, Carnival is celebrated all over Italy: every single city has its events, masquerade balls, costume parties and parades taking place in streets, piazzas and restaurants. Masks, sweets and having fun are the most important things during Carnival: it’s a chance to be happy and cheerful, not only for children, dressed up in costumes. Wherever you are in Italy in Carnival time, just grab a mask you like and enjoy the celebrations! Budweiser Clydesdales 2013 Mardi Gras Schedule!! 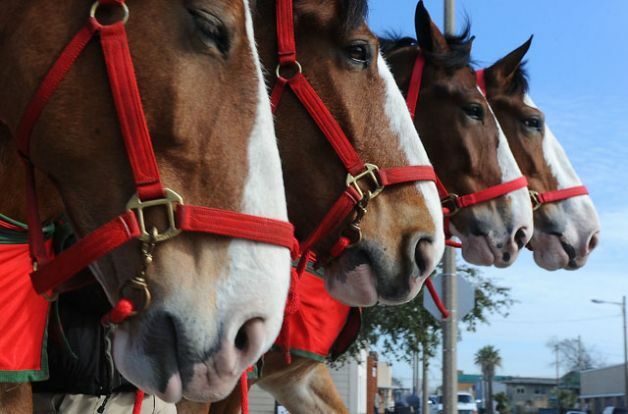 Here come the most incredible draft horses in the world, the fabulous Budweiser Clydesdales hitch, six huge Clydesdales at a time, pulling an old time beer distributors truck on St. Charles Avenue and Canal Street. The Clydesdale is a breed of draught horse derived from the farm horses of Clydesdale, Scotland, and named after that region. 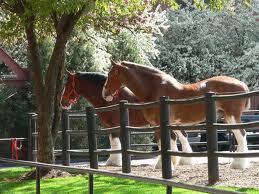 Although originally one of the smaller breeds of draught horses, it is now a tall breed. Often bay in colour, they show significant white markings due to the presence of sabino genetics. The breed was originally used for agriculture and haulage, and is still used for draught purposes today. 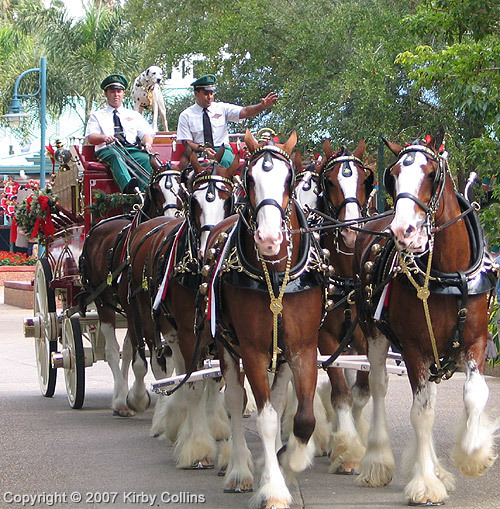 The Budweiser Clydesdales are some of the most famous Clydesdales, and other famous members of the breed are used as drum horses by the British Household Cavalry. They have also been used to create and improve other draught breeds. The breed was developed from Flemish stallions imported to Scotland and crossed with local mares. The first recorded use of the name “Clydesdale” for the breed was in 1826, and by 1830 a system of hiring stallions had begun that resulted in the spread of Clydesdale horses throughout Scotland and into northern England. The first breed registry was formed in 1877. In the late 19th and early 20th centuries, thousands of Clydesdales were exported from Scotland and sent throughout the world, including to Australia and New Zealand, where they became known as “the breed that built Australia”. However, during World War I population numbers began to decline due to increasing mechanization and war conscription. This decline continued, and by the 1970s, the Rare Breeds Survival Trust considered the breed vulnerable to extinction. Population numbers have increased slightly in the intervening time, but they are still thought to be vulnerable. All downtown Mobile Mardi Gras parades roll on Route A unless otherwise noted. Parade schedule dates and times are subject to change. This is rather surprising, not because Mobile’s Mardi Gras isn’t fun or historic, but because the New Orleans Mardi Gras is much better known.